The Crawford Hotel is the newest among hotels in downtown Denver. 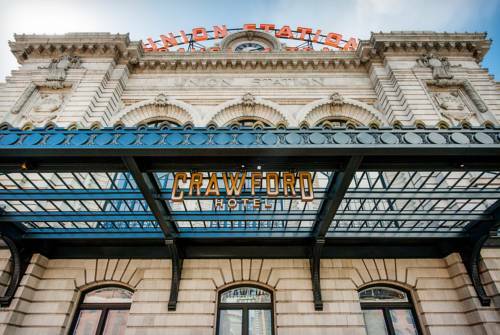 Truly like nothing Colorado has seen before The Crawford effortlessly combines the historic elements of Union Stations past with the smart luxury guests crave today. From Union Stations eclectic restaurants and shops to Coors Field home of The Colorado Rockies just two blocks away guests experience the essence of Denver all within steps. Keep up your wellness routine at The Oxford Club Spa and Salon or explore Denvers extensive biking and running paths. Located in Denvers Union Station the hotel is a respite among the hustle and bustle of downtown Denvers center. Located in Lower Downtown Denver. Walking distance to all major sports venues/business district/restaurants/public transportation and nightlife. One half hour drive from the airport. The Kitchen Next Door will open complementary to The Kitchen Denvers LoDo location. The community bistro created by Kimbal Musk Jen Lewin and Hugo Matheson will reside in the south wing of the building. Snooze an A.M. Eatery will serve breakfast and lunch daily at Union Station. This will be Jon and Adam Schlegels sixth location located in the north wing of Union Station. This specific location will also serve take-away options for travelers. Chef Jennifer Jasinski and her business partner Beth Gruitch who own Rioja Bistro Vendome and Euclid Hall are planning to open Stoic and Genuine a seafood-centric restaurant in Union Station. Squirrel Gulch was renamed for comic strip hero Steve Canyon as a tribute to World War II vets.